Singapore: satellite uplink transmissions - Globecast. 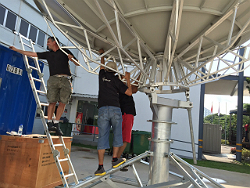 Singapore, July 2015 : Globecast has announced that it has supplied distribution services for ten broadcasters covering the recent SEA (South East Asian) Games. Globecast was contracted by HBS, the Production Partner of MediaCorp, official media partner and host broadcaster to provide distribution. The 28th occurrence of the Games saw this major sporting event return to Singapore after a 22-year gap. 36 sports and 402 events featured in the eleven-day spectacle including more unusual sports like wushu, sepak takraw and wakeboarding. Globecast facilitated the distribution of ten channels to regional host broadcasters across Asia, creating two multiplexes onsite at the International Broadcasting Centre (IBC), one with six channels (in 36 MHz) and one with four (in 24 MHz). These were then uplinked via a 4.5m dish at the IBC dish farm using NS3 modulation.